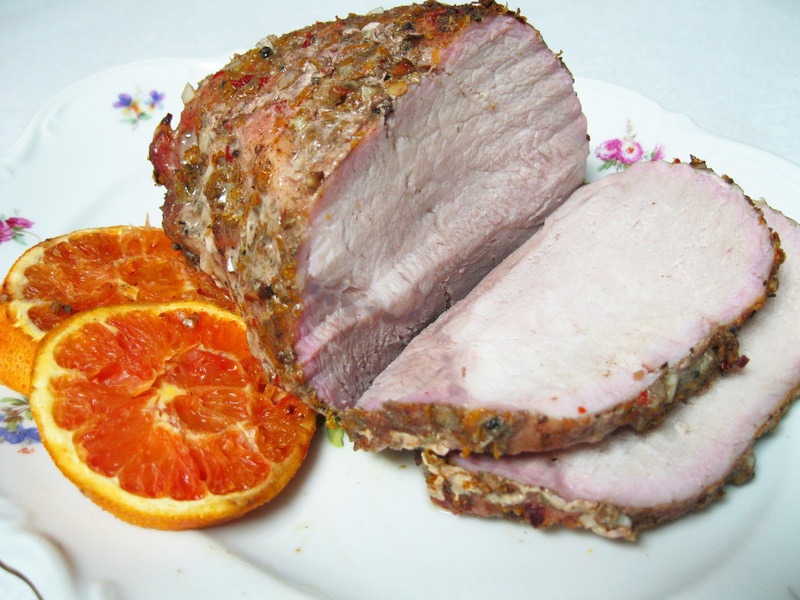 Want a change of pace in preparing a pork roast? The orange zest does it! 1. Preheat oven to 375ºF. Line a 9" x 9" baking pan with foil and coat the foil with olive oil cooking spray. 2. On a cutting board, combine the garlic, orange zest, thyme, salt, black pepper, and red-pepper flakes. Chop together until the garlic is finely minced and the ingredients are well blended. Rub all over the pork. 3. Place the pork in the prepared pan. Roast for 50-60 minutes or until an instant-read thermometer inserted in the thickest part registers 155ºF. 4. Remove the pork from the oven and let it stand for 10 minutes before carving into thin slices. Serve with orange wedges or slices as a garnish. Ok, this is the second time I've fixed a pork roast and gone by the recipe's directions for cook time. I honestly am baffled as to how a roast is suppose to be done in only 50 minutes and an internal temp of only 155º? I mean my meat thermometer states for pork it needs to be 170ºF. And as for cook time, I remember at least 1 hour, if not closer to 2 hours. So needless to say, use 50 minutes as a starting point. To make this a meal in one dish, I cut red potatoes in half and added them at the same time I put the roast in the oven and then 15-20 minutes before the roast was done, added mushrooms. Who doesn't love easy cooking and clean up?